Located in Clovis, California, Preferred Wire Products is a family-owned company headed by Howard ‘Swede’ Jaenson, who has over 40 years experience in designing and manufacturing stucco netting machines and fabric. Made in the USA: Preferred Wire Products’ netting machines are not only the newest in the industry, but include a proprietary ‘soft-weave’ design that reduces tension during the weaving process. This creates a softer, more pliable netting that lies flat against the wall and folds easily into corners. At thirty-seven inches wide, Preferred Wire Products has the widest standard 20 gauge netting roll in the industry. 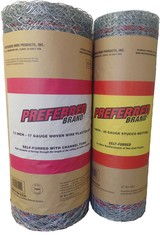 Further, Preferred Wire Products has developed ‘Channel Furr’ (patent pending) for its’ 17 gauge netting. ‘Channel Furr’ has over 140% more furr points within the netting, assuring strong embedment. As we continue to innovate, we will strive to maintain the highest standard of quality and service in the industry. That’s our commitment to you, our customer and partner. v More Wire: Extra Inch = Weep Screed to Window Sill: covered! v 140% more furr points per square yard than traditional-furred netting. v 3/8 ideep’ furr is standard. Customized furring also available. v ‘Channel Furr’ imbeds all the twists, putting more wire & more strength into the wall. v Innovative ‘SOFT-WEAVE’ process keeps the netting FLAT and PLIABLE to the end. Be assured of Embedment: Get a pencil's worth using 3/8" deep 'CHANNEL FURR' 1.5"-17 gauge netting with 140% more furr points!